Holding back floodwaters to protect homes, businesses and belongings. Flood barriers come in a variety of different forms. The Floodstop flood barrier system is designed to be a highly effective, easy-to-deploy and convenient-to-store flood defence system. On this gallery page we have provided images of the system in action, holding back floodwaters to protect homes, businesses and belongings. Flood barriers are needed to provide protection. Typical deployments of sandbags provide next to no protection against large bodies of flood water. They are permeable, prone to move and provide a very poor seal. 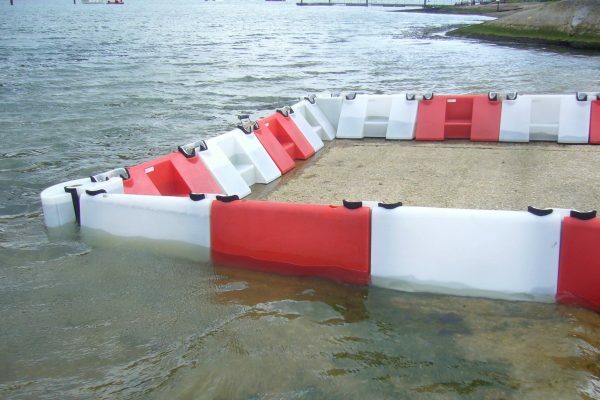 Floodstop flood barriers fill with flood water and provide very good protection against large bodies of flood water. In this image they can be seen in a test deployment holding back a vast quantity of tidal water in a harbourside location. The image shows that the waters are completely held back from the protected area and gives a very good illustration of how the barriers can be used to protect buildings from flood water damage. Long runs of flood defences are notoriously expensive or prone to failure when poor quality temporary measures are employed. 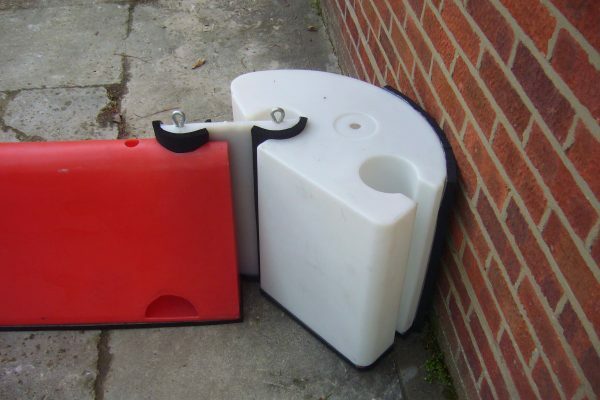 The unique design of the Floodstop flood barrier, makes it a very suitable flood defence for use on long runs over relatively even ground. This image illustrates how a home is protected from rising flood waters over a relatively long run. 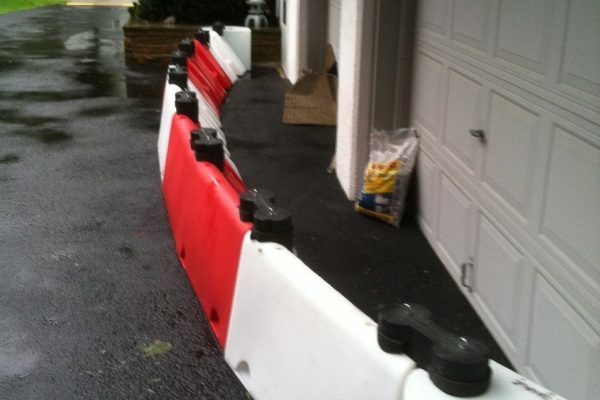 In a similar way Floodstop barriers can be used to provide perimeter protection around your property. 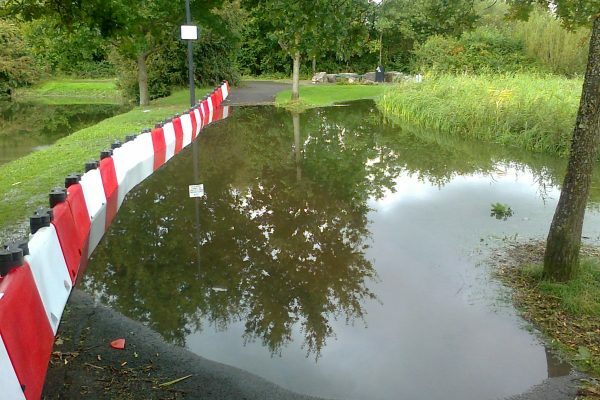 River flooding is commonly protected against using Floodstop barriers. As well as protecting homes and businesses, flood waters can cause damage to roads, farmland and recreational facilities. As a cost effective solution Floodstop barriers can be feasibly used to protect all types of properties. Protecting fresh water supplies in times of flood is essential to prevent pollution of vital supplies. Often fresh water supplies can cover large areas and easy to deploy protection is essential. 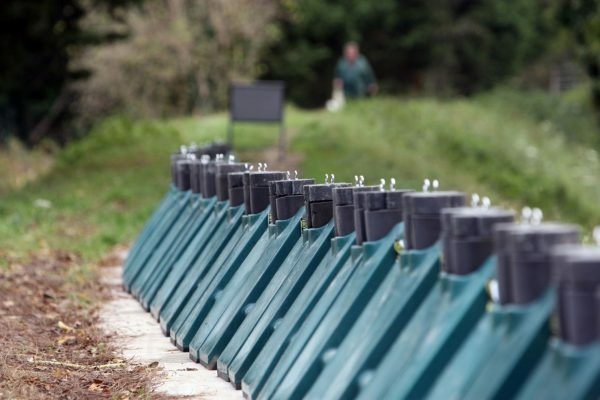 This image shows Floodstop barriers being used to protect a fresh water reservoir in the UK. 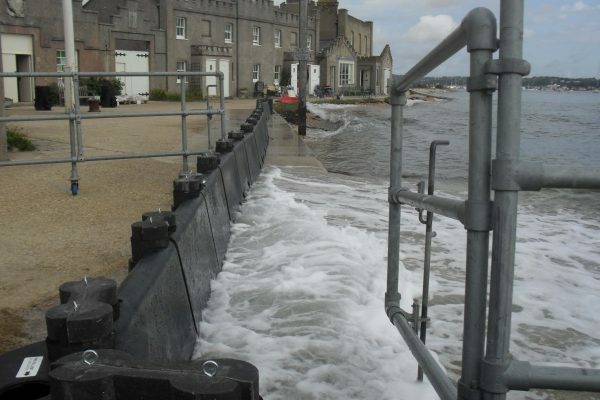 This image shows Floodstop barriers being used to protect properties on Brownsea Island in Poole Harbour against storm surge high tides. Extraordinary high tides and tides exacerbated by storms are common causes of flood damage. 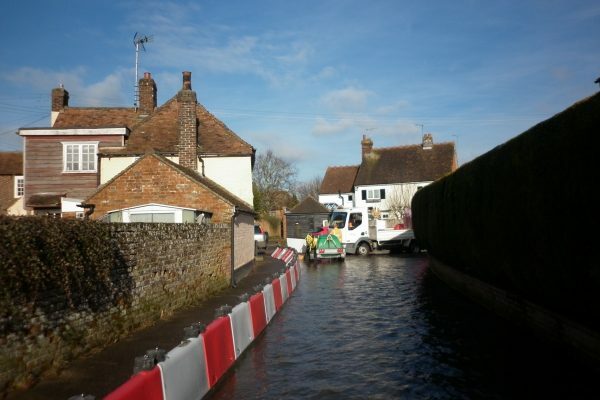 They tend to happen relatively infrequently and as such permanent flood defences are either unfeasible or weren’t designed to deal with these events. In these circumstances temporary solutions are required. For relatively frequent protection, purchasing Floodstop barriers is sensible as the barriers are designed for convenient storage when not required. It is also possible to hire the barriers for the required period of protection. Please note that it is important to order Floodstop barriers with plenty of advance notice when hiring to accommodate delivery times. Unfortunately flooding can have an equally devastating affect on any property in its path. Fortunately there are methods of protection available to protect all types of property. Whether it is your home, a shop or an office that you need to protect, Floodstop flood barriers could be a solution for your flood protection. If you are looking for temporary flood protection that is easily stored and reusable Floodstop could be the answer. Shorter runs of Floodstop flood barriers can be used for protecting doorways, driveways and entrances. Longer runs can be used for more extensive perimeter protection. Floodstop flood barriers are proven protection against flooding for all types of businesses. Effective seals are essential to providing protection against flood damage. This is a regular weakness of some temporary flood barrier solutions. The Floodstop system uses a modular wall unit that provides a flexible seal to be used against the walls of a building or permanent floodwall. This modular unit ensures the seal required to protect against flood waters breaching the defence. Harbour and river walls typically have gaps to provide simple access to the water. Unfortunately in times of flood, these gaps provide openings for flood waters to escape. A permanent solution is rarely required and in most cases would be cost prohibitive. Temporary flood barriers provide the required solution. 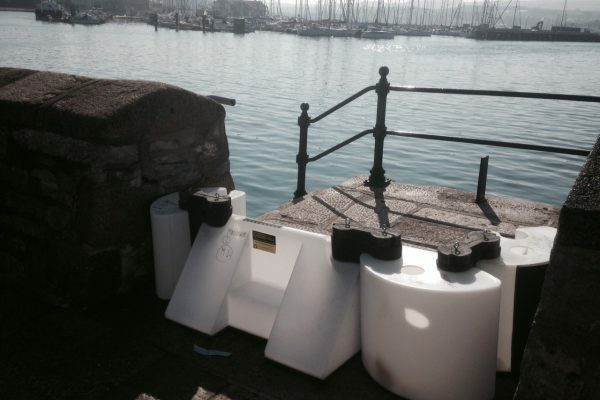 In this image the modular Floodstop barriers can be seen in action at Plymouth quay, providing suitable flood protection for gaps in quay wall. Protecting your home from flooding is an important consideration when living in a flood prone area. 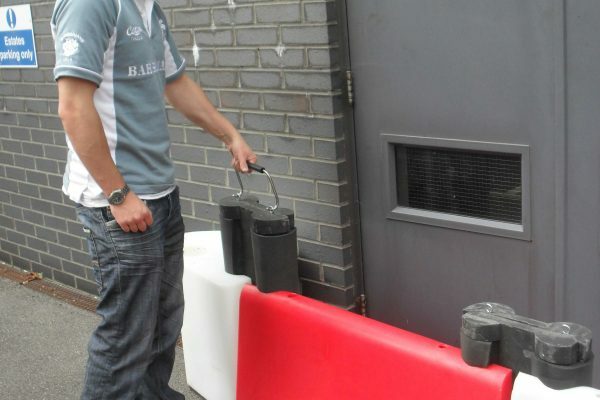 Floodstop flood barriers are used around the UK and worldwide to protect homes and belongings from flood water damage. 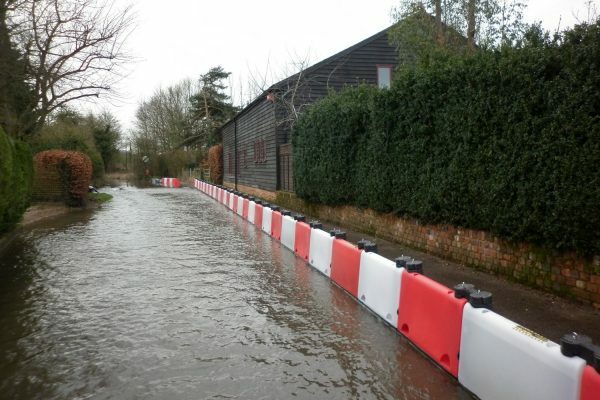 The 0.5m barriers are a robust solution in areas where flood waters are highly unlikely to exceed 0.5 meters in height. In this image you can see a length of barriers being used to protect homes from flooding. Floodstop barriers can be quickly deployed and easily stored, making them a useful solution for both homeowners and local authorities. They can also be easily relocated to provide protection where needed most. Modular, so Floodstop can protect any size door. The walls of buildings tend to hold back floods relatively well, but doors are rarely water tight. Just 50 centimeters of floodwater can cause extensive damage to a property if it breaches a door. Protecting doorways and other entrances can be a very cost effective form of flood protection in many instances. Floodstop flood barriers are designed to provide good doorway flood protection. The main Floodstop units are connected to the modular wall units at either end to create a protective flood barrier around doorway entrances. Customers also regularly use this approach for walled driveway entrances to prevent floodwaters from entering their properties. In this image a longer run of floodstop barriers with modular wall units has been used to provide flood protection across the doorway entrances of a large 4 bay garage.